OEM part number 3853807-0 is for stern-drive years 1986 to 1995. 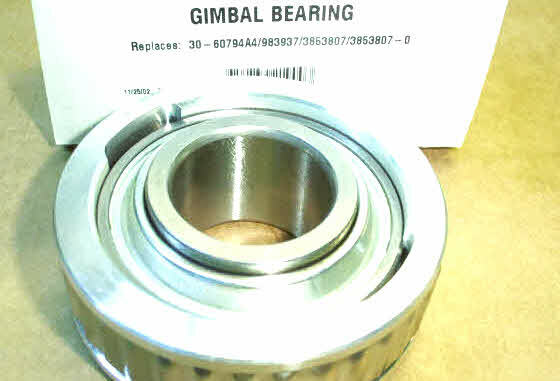 Gimbal bearing assemblies should be greased after installation and then needs greased each year or every fifty hours of use. Transom bearings turns at same speed as engine up to 45,000 rpm and are not lubricated with oil. 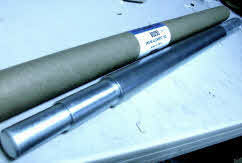 Made with low carbon steel which can operate at higher temperatures. Larger area between the shields allows for 30% more grease. GLM marine after-market OMC Cobra parts transom mount gimbal bearing drawing. Drawing including Cobra transom service kit part number 21962. Bearing is used in Volvo Penta SX stern drives OEM-3853807-0 and Mercruiser outdrives OEM-30-60794A4. In some cases during transom repairs the engine can drop a small amount. This happens when the drive shaft is pulled out the engine hub. After installing new gimbal bearing the engine alignment tool may be required to line up bearing and engine hub in transom assembly. Boats that have soft stringers, were the engine mount has dropped down will require adjustment. Shims will be required to bring the engine mounting brackets back up to the original position. Engine drive shaft should then slide into new bearing and engine hub.